I received my NEL Sharpshooter coil for my E-trac from Gold Digger Metal Detectors the other day. I’ve been dying to try this baby out, and I believed the “hype”, because there was so much of it. Now that I’ve experienced the coil first hand, I’m going to hype it up some more. I gave the Sharpshooter a good workout at a some very trashy old homesites, and with the size of the coil (9.5 X 5.5), its great for getting into small or difficult to reach spaces. It was also picking out targets with junk on or near them with no problem. Its very precise and sensitive and a must have for sites where target separation is necessary. I had thought I might lose some depth, but that didn’t seem to be the case, as I was finding silver dimes at about 7 to 8″ deep. I also felt that the Sharpshooter pinpointed a bit better than the stock coil. I did notice a little bit of a difference with some of the target id’s, but then again, that could just be me paying more attention because I was using the new coil. I also noticed sometimes it read rusty nails as silver, but the separation and depth more than make up for that. 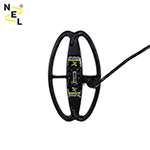 The NEL Sharpshooter coil is stable and sensitive with better discrimination and target separation, and is ideal for junky sites. I give the NEL Sharpshooter coil an A+ rating. It performs as advertised. Great Review, very useful info! Its always good to know about a product before you buy it. Glad it was helpful to you. So pleased you bought one and like it. I just love mine. One benefit you didn’t mention was the weight. It’s so light. I’ve been grounded through ill health lately so I’ll look forward to using it instead of my latest ‘baby’ a 13″ Ultimate till I build up my muscle power again. You’re right, it is lightweight. Nice to see others are as pleased with the coil as I am. Hope your back to hunting soon!